No one knows whether Brett Kavanaugh would vote to overturn Roe v. Wade outright or simply gut it. But even on a lower court, Kavanaugh put arbitrary obstacles in the way of someone desperate to end her pregnancy. Shortly after his inauguration, President Donald Trump, uniquely attentive to his debt to the religious right, appointed anti-abortion activist E. Scott Lloyd to head the Office of Refugee Resettlement, despite Lloyd’s lack of relevant experience. The position gave Lloyd authority over unaccompanied minors caught crossing into the United States, authority Lloyd exploited to try to stop pregnant migrants from getting abortions. Last year, thanks to Lloyd’s interference, a 17-year-old from Central America had to wage a legal battle to end her pregnancy. Known in court filings as Jane Doe, the girl learned she was pregnant while in custody in Texas, and was adamant that she wanted an abortion. In keeping with Texas’ parental consent law, she obtained a judge’s permission, helped by a legal organization called Jane’s Due Process. Jane’s Due Process raised money for the abortion, which was scheduled for the end of her first trimester. 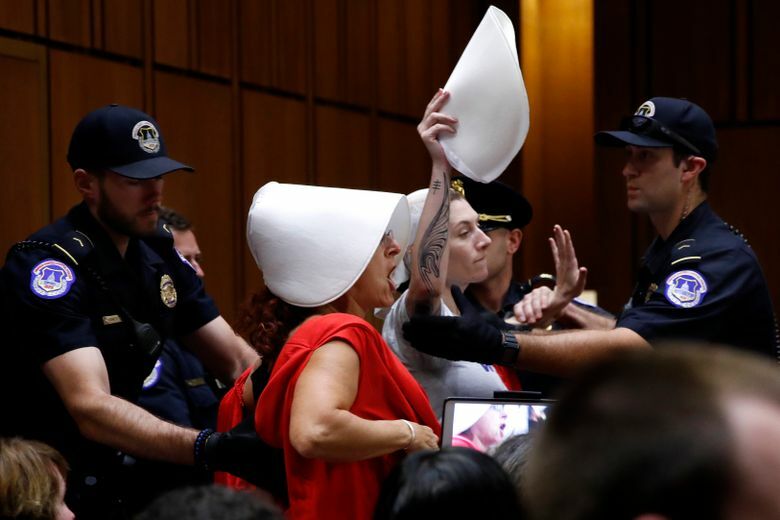 It’s fitting that last week’s Kavanaugh confirmation hearings were regularly interrupted by the sound of women screaming. Again and again, protesters, most of them female, cried out for the preservation of their rights, and were arrested. Republican men were contemptuous. “What’s the hysteria coming from?” asked Sen. Ben Sasse of Nebraska. A famous pro-abortion rights poster from the 1980s proclaimed, “Your body is a battleground.” Kavanaugh is likely to join the Supreme Court because in 2016, the woman whom most women voted for was defeated. Now our bodies are subject to occupation.